Eliminate one of five annual mowings by keeping your blade set high. The right height for you depends on your grass type. There are several reasons not to cut your grass too short. Grass grows from the crown, not the blade tips, a trait that makes grass ideal for lawns. Grass keeps growing despite regularly cutting off the upper stem, leaf sheath, and blades. Keeping grass longer allows it greater surface area to carry out photosynthesis, which in turn results in healthier plants. In addition, taller grass grows slower than shorter grass. You can use this fact to eliminate up to 20 percent of the mowing you do annually—an average savings of about eight hours a year, not to mention the savings of gasoline and wear on equipment. Lastly, by keeping your grass at the upper end of its recommended mowing height, you can prevent most weeds from germinating—and thereby eliminate the need for herbicides. 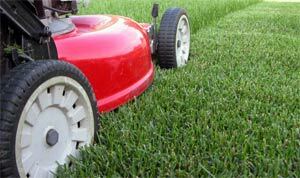 It is important not to damage grass crowns by accidental scalping with the mower. No crown, no grass!